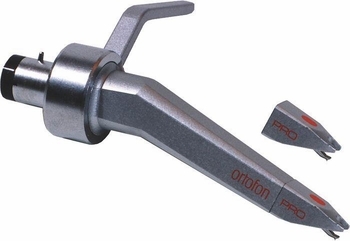 Ortofon CC Pro Kit Cartridge with Extra Stylus DJParts - All Variety of Parts that DJ Needs. Spherical stylus design is rugged and doesn't dig as deeply into the groove, so for skratch applications it's easier on your records and lasts longer. And the cartridge looks really cool. 3-5 grams tracking range. 7mV output. Includes extra stylus.